is usually quiet with no swim classes in session. Please not we are a private facility and have a restroom but no showers. Our pool is heated to 88-92 degrees so there is no initial cold shock. Your joints and muscles begin to loosen up immediately for easier movement. The Warm water relaxes muscles and dilates vessels increasing blood flow to injured areas. Patients with muscle spasms, back pain fibromyalgia benefit greatly from warm water temperature. Most physical therapy exercises can be done in the pool, because the buoyancy of the pool supports the weight of the patient which reduces stress that is placed on the joints. With less joint stress it is easier and less painful to perform exercises. The viscosity of water provides resistance for muscle strengthening without the need of weights. Using resistance with buoyancy allows a person to strengthen muscle groups with decreased joint stress that cannot be experienced on land. Who is a Candidate for Aqua Execise? It is important to know that aquatic exercise is not for everyone. Please check with your physician and provide a Drs. Note before you begin an aquatic exercise program. You are not a candidate for aqua exercise if you have heart disease, infection, open wounds, fever, or bowel/bladder incontinence. Please bring a Drs note releasing you to use our pool for exercises. 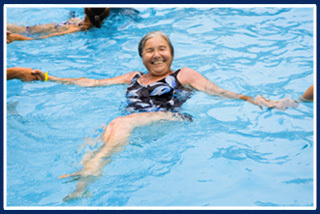 A doctor's release is required to use our pool if you are using it for theraputic or rehabilitation reasons.